Bill Shaikin of the L.A. Times always seems to have the scoops about the ownership situation. Here are his tweets from this morning at 9:55 and then at 10:50 AM. 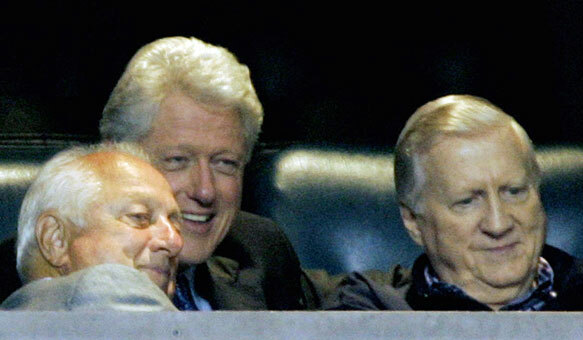 Bidders advancing in #Dodgers sale: Cohen, Magic/Kasten, Hindery/Barrack, Kushner ... and at least two more. 7 #Dodgers bidders still in running: Magic/Kasten, Cohen, Hindery/Barrack, Kushner, Kroenke, Disney/Gold, Casden. Seven remain and I have my favorite. The criteria I use to select them is quite different from most. Perhaps I’m too picky, but the ideal Dodger owner for me must be a person/s that has tons of money and be a Dodger fan. Someone that loves the franchise. A baseball man that knows who Ron Perranoski, John Roseboro, Wally Moon, Manny Mota, and Jim Brewer is. He should be able to name off all the Dodger Rookies of the year and when asked where the Dodgers finished in 1971, should be able to say they finished 2nd in the West that year one year behind the Giants. 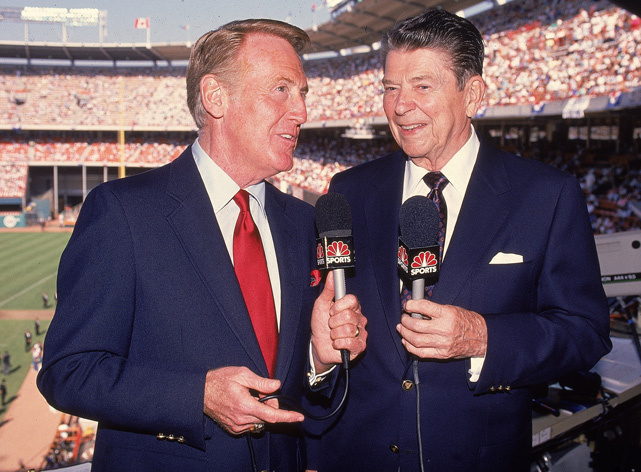 Ideally, our owner should understand Dodger history and want to build upon it. He should be someone that hates the Giants, be livid about the Mike Piazza deal and passionate about the club keeping its tradition alive. He should be willing to upgrade Dodger Stadium, strengthen the farm system, rebuild the international scouting departments and ready to spend big money to be competitive year after year. He should be passionate about returning a World Series Championship to Los Angeles. He should also familiar with Los Angeles, having SoCal roots and be understanding of the Los Angeles sports landscape. As I see the remaining bidders, none seem to fall within the parameters that I mentioned above. Perhaps that’s why I was so keen on a wild card like Josh Macciello. One of the remaining bidders however, meet parts of my criteria, and I can live with that. Let me start off and say that Cohen and Kushner are out and out carpetbaggers in my opinion. I’d have to be convinced otherwise, but they bring to ownership New York ties and loyalties to other franchises. They aren’t SoCal bred and neither has SoCal roots. How could they possibly be passionate about the team with the exception of the financial gains that could potentially strengthen their financial clout in the world? Steven Cohen has partnered with Agent Arn Tellem. He has the backing of L.A. institutions Eli Broad and David Geffen. That puts his bid for me a tick above the Kuschner group that I see as a Trump family intrusion into the process. Tom Barrack of Colonial Capital in Santa Monica and Leo Hindery (the founder of the Yankees cable channel) have teamed up. Barrak’s firm has experience in enhancing professional sports teams values overseas. 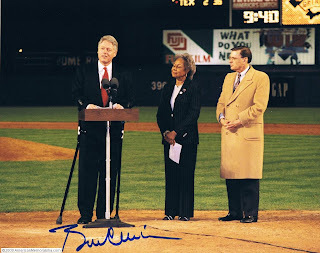 His firm was able to develop shopping centers and hotels around the ballpark of the Japan Fukuoka team. We all know what the YES network has done for the Yankees value. Perhaps this partnership still being in the running is good news. I prefer them over the two previously mentioned, due to Barrack’s involvement. But honestly, what do we know about them? The Disney/Gold group has L.A. roots, but what do they know about Dodger baseball and running a sports franchise. Early on, O’Malley was rumored to be a part of them, but it appears that is not so now. There aren’t a lot of facts known about them either that I can find. Kroenke’s group scares me the most I believe because it appears he is willing to get into bed with McCourt and allow him to retain the lots for a potential NFL team move. Years ago,that seemed like a great idea, but alternative plans have since been made for the NFL in Los Angeles. Anything with McCourt’s stamp on it has to be looked at with a jaundiced eye. One thing is guaranteed. If you enter in to an agreement with McCourt to continue a business relationship with him, it is only a matter of time before he goes litigious on you. It’s a given, you will be sued sooner or later. Any owner doing their due diligence in preparing for this purchase must know that they need to steer clear of that man and his entities once the sale is complete. Local developer Alan Casden remains. Reports are that his group doesn’t have the financial muscle as the New York groups. He also has a history in a previous attempt to land the team of saying that Dodger Stadium needs to be razed. I am actually open to that option only because of McCourt’s insistence to holding on to the parking lots. It has been reported by Shaikin in the past that the new owner is required to sign a lease through 2030 to McCourt for use of the parking lots. So there is uncertainty as to where this issue stands with regard to the remaining bidders. I am in agreement with Bob Daly who said last month that anybody purchasing the team without the parking lots would be absolutely crazy. Has Casden changed his tune and decided to continue to bid for the club and pay McCourt’s BlueLandCo entity $14 million per season? So who does that leave remaining? My personal favorite: Magic Johnson and Stan Kasten. I believe that Magic has handled the situation in the wisest fashion. He has said nothing but positives about McCourt, knowing full well that Frank is the man that will be picking the new owner. He has remained tight lipped about everything. His silence has been deafening. He did his homework and has surrounded himself with a sound baseball man and the Guggenheim group that is loaded with money. He’s a L.A. institution and he is excited to develop a winner and save the Dodgers. Magic has a history of turning troubled entities into profitable and growing businesses. Johnson understands the meaning of the Dodgers to the Los Angles landscape. Frankly, I believe that we all need to get behind the Magic Johnson bid. MLB should be thrilled with the potential of an African American businessman, with Los Angeles ties, as the Dodgers owner. Viva Magic! I’m on board. Cool to see Dee Gordon hanging out with Maury Wills and Davey Lopes. Hopefully he soaks in as much information as possible. 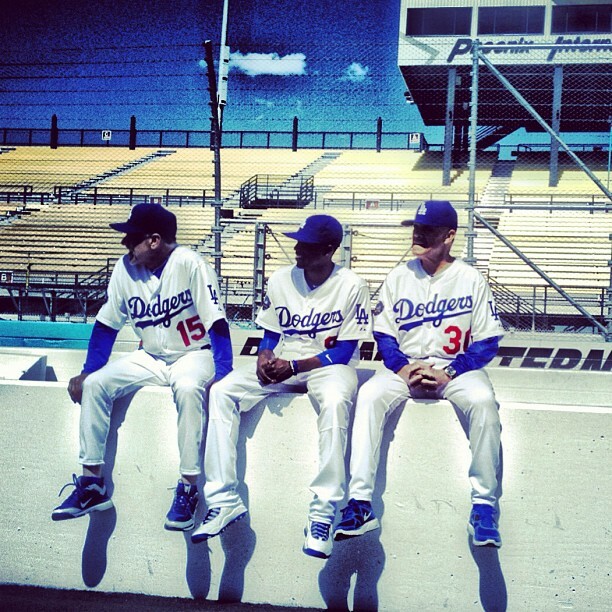 Prediction: This trio will have accumulated 2,000 stolen bags by the end of Gordon's career. In the few personal encounters I have had with Andre Ethier, he has been polite and friendly. He has been nothing but kind to me when talking with him and I like him, but I must say that the story out of Camelback Ranch of his arrival to camp today is disturbing. I don’t understand this guy sometimes. He whined last year and took his attitude to the press when he claimed the Dodgers were forcing him to play hurt. Then he got upset when they do their job, which was to simply report the story. Nobody was out to screw him over. They just told Coming in to Spring Training with an attitude isn’t the greatest way to start off the year. 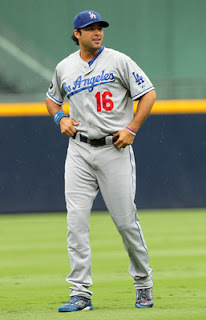 I would say that perhaps Ethier just had a bad day, but he has a history of being an unpredictable and ornery guy. It’ll be interesting when the eventual inevitable comes and he signs with Boston, Philadelphia or New York. Dealing with the demanding writers back there will definitely be a wake up call for Ethier. Imagine how he’ll be treated by the Red Sox faithful when he continues to hit .220 off of left handers with a .258 OBP while drawing a salary of $12 or $13 million per year. They will crucify him. Some guys don’t realize how nice they have things until they depart. I would suggest that someone have a chat with Ethier, but he’s no kid anymore. He’s a veteran and a seasoned all-star. He should know better and he should have learned from his past mistakes. How dare the writers say “good morning” to him? If Frank McCourt keeps the parking lots, and the parking lots are not under bankruptcy protection, can’t Bryan Stow and his lawyers go after that McCourt entity? The crime occurred in the lots, where there was insufficient security and lighting. Perhaps Stow’s attorneys should simply sue BlueLandCo. and abandon a suit against the Los Angeles Dodgers. BlueLand Co was the only McCourt entity that apparently is in the black and is profiting. If the new owner of the Dodgers is unable to purchase the parking lots along with the team and all other Dodger properties, would you be opposed to them leaving Dodger Stadium? I absolutely love Dodger Stadium. It is heaven on earth in many respects. I know it as a magical place with so many enjoyable memories over the years. 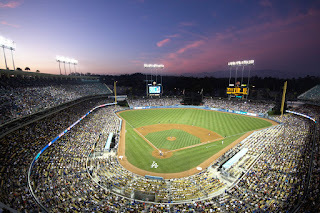 There is almost nothing as breath taking as Dodger Stadium at dusk, with the San Gabriel's in the background and mystic colors and luminescent glow as the sky transcends from blue. to orange, to purple, and then the darkness of night. But I dislike what McCourt has done so much that I’d throw that all away and approve of a move to new digs if we could rid ourselves of the man. It takes a high level of anger and loathing to get to that position in my mind, but that's where I am. 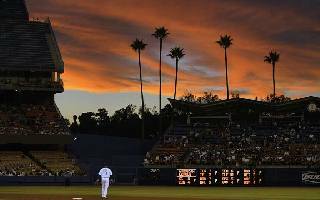 If the new owner of the Dodgers is unable to purchase the parking lots along with the team, would you be opposed to them leaving Dodger Stadium? 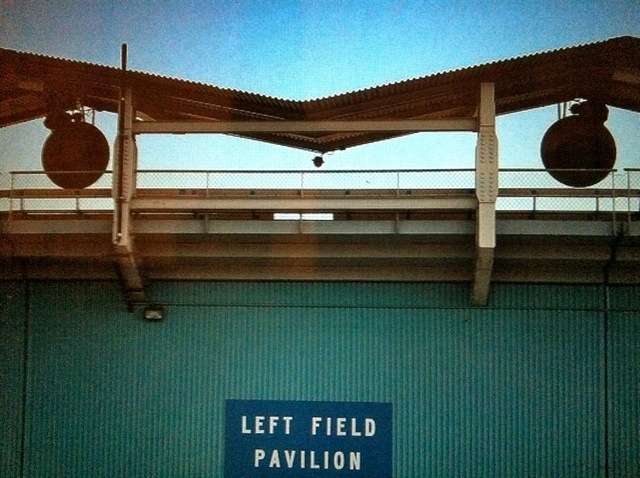 1 - New owner with deep pockets, but he has to remain at Dodger Stadium with McCourt owning the parking lots. 2 - New owner that builds a new downtown stadium and moves away from Dodger Stadium rather than being held hostage and have to allow McCourt to collect parking revenues. 3 -New owner, buys the team and the parking lots who agrees to refurbish 51 year old Dodger Stadium. Unfortunately, as evidenced by Caruso/Torre’s withdrawal yesterday, option number three appears to be off the table. If Frank McCourt continues to collect revenues off of the Dodgers, there is a large segment of fans, (a very large segment in fact), that will have nothing to do with the team. Look at the other blogs, the venom of fans and bloggers is evident. The man is as despised as any person ever in Los Angeles. There are many that will give up the Dodgers rather than put more money into McCourt’s coffers. Best to leave Frank McCourt with acreage of parking and an empty aging Stadium smack dab in the middle of it. If Kroneke is striking a deal to buy the team and not the lots, with visions of using McCourt to build a football stadium for his Rams in the parking lot, it'll be a big mistake. He’ll be extremely surprised at the outcry and opposition to such a maneuver. Swap meets and used car sales may be the way of the future for that real estate. Perhaps Mr. McCourt can gets some ideas from the Wayans brothers in this "In Living Color" clip from Dodger Stadium. 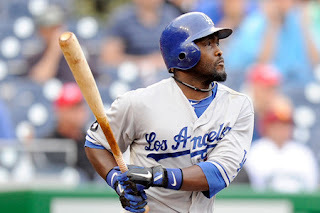 How Much Playing Time Will Tony Gwynn Jr. See This Year? 136 games, 340 plate appearances. That is the in game action that Tony Gwynn Jr. saw last year. His role was valuable, and often times as a late inning replacement or pinch hitter. By my count, Dan Mattingly used him in that role for 70 games last season, meaning he was written into the starting lineup only 66 times. That’s a role Gwynn will fill again this year, unless the team is plagued with injuries, Tony most likely won’t see as much action. Why? Well there are too many outfielders: Kemp, Ethier, Sands, Rivera and then there is Hairston that can move out there in a pinch too. Tony was valued as a defensive replacement, a role I see him continuing to play in 2012. Though his UZR reduced substantially from his lead leading numbers the year before, I certainly didn't visibly notice a deterioration in his defensive range and overall skill out there. Gwynn mostly saw action in left field where he saved a game or two with some spectacular defensive plays as recorded by Bobby Crosby at Dodgerfilms on April 29th. Gwynn proved to be a valuable addition not only as a defensive replacement, but as a guy that could provide speed on the base paths as a pinch runner and with the occasional pinch hit. Twenty two stolen bags at a 79% success rate was more than we ever could have expected from Gwynn, who is 29 this year. Then there are the intangible values of Tony that he brings to the clubhouse. Positives that are immeasurable and they even included Tony Sr’s presence that was helpful to such vets as Matt Kemp. Had Gwynn delivered and convinced Prince Fielder to sign with the club, he would have been even more influential, by bringing another solid piece to the team. We had read about it this week. He certainly tried. It is no secret that their friendship influenced Fielder in seriously looking at the Dodgers. It wasn’t to be, but it was closer than we thought. Overall - I’m happy that Gwynn as a Dodger. 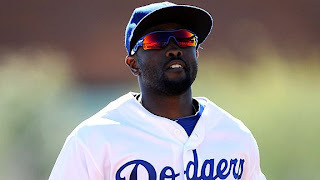 I think he is an ideal reserve outfielder because of his defense, speed, knowledge and presence. Last but not least, having once been a San Diego resident enduring the constant Dodger loathing from the Padre faithful, I get extra joy in knowing that it must be really hacking off Friar fans that Gwynn is thriving in Dodger blue. On the day, pitchers and catchers reported, you’d think that I’d have something interesting to say about the events in Glendale, AZ yesterday, but sometimes fate intervenes. 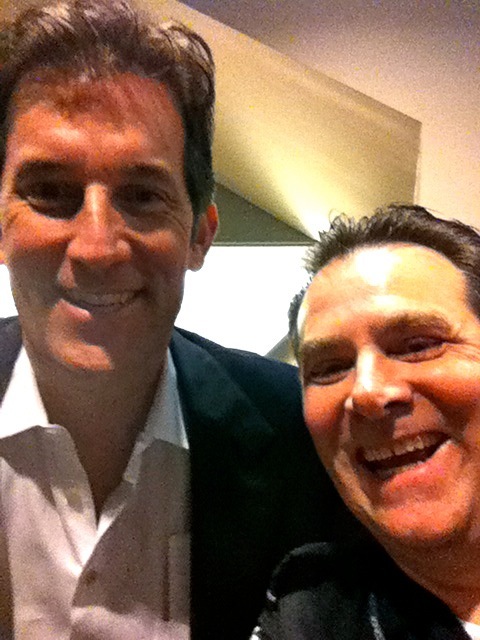 I was working at San Francisco Airport last night, and I stepped out into the general public area and who do I see? One of my best friends that I grew up with, my Strat-O-Matic buddy, baseball/basketball/football whatever sport was in season pal from all those years ago...about to step on an escalator heading to his flight. I have to admit, the coincidence was quite amazing. The fact that I randomly picked that precise moment to walk out onto the main airport concourse, in that particular spot in a very large airport. Well the chances of running into him were about a million to one. Literally. But then again, now that I think about it, 15 years ago at this very same airport, I ran into his brother Clark too, so maybe its time to admit these run-ins as fate and not luck. “Isn’t it amazing how much we look like our dads now?” he said. He was right, though I’d have to admit, he’s quite the dapper guy. Mike has actually kept his age very well and he’s looking pretty good for a guy in his late 40s. But I wasn’t going to argue that he's better looking than me. “You’ve got that right Mike,” I said. “What are you doing in town?” I should have known the answer, but I just don’t follow the NBA like I used to. “Well I was calling the Clipper game last night,” he said. Yes, my buddy, the one from so many years ago when we were Little league age. Well he kinda made it big. At least big compared to me I should say. When I say big, I mean 6’ 10” big, National Male High School Athlete of the Year 3 Sports Star big, NCAA All American big, NBA first round pick (13th player selected) big, Boston Celtic big, European Spanish League Scoring Title Big, and finally Los Angeles Clipper Broadcaster for 8 years (Ralph Lawler’s partner of 4 years) big. And I’ll take ALL the credit too. Ask his mom, Marie...she told me so a few years back, that I got him into sports at a young age. I have a hard time believing that, knowing how competitive he and his older brother Clark were, but if she says so, who am I to argue? A few months back I wanted to write this article. I wanted to tell the story of two boys that grew up eating, drinking, breathing all things sports. And how one of them made it big and the other got to be fairly good in his work softball league. One of them, (that would be me), just sat back and enjoyed watching his buddy from a distance as he gained fame and excelled in the game. I used to bring a transistor radio in to work and listen to his college basketball games that I could pick it up up on scratchy frequencies from the desert border outpost I worked at in the late 80‘s. I’d watch Sportscenter for glimpses of him in NBA games, even if it would be just a brief view of him sitting on the bench. His career has been watched by me from afar for years. Now I get to see him in action from the announcer's chair. Though Mike and I haven’t remained in contact, our friendship remains after all these years. I believe if I had reached out and tried to remain in constant communication, it would have happened, but I never thought it was my place to bother a very busy guy. “He certainly deserved his space,” I thought. A few months ago, a reader of this blog named Jedd Parkinson, saw that I mentioned in a post that I follow BYU sports and he fired off an email to me. It turns out that he writes for a BYU Sports publication (Total Blue Sports) and the was kind enough to comp me a subscription. I gave him permission to use my Al Davis/Dodgers Connections article that I posted a few months back. 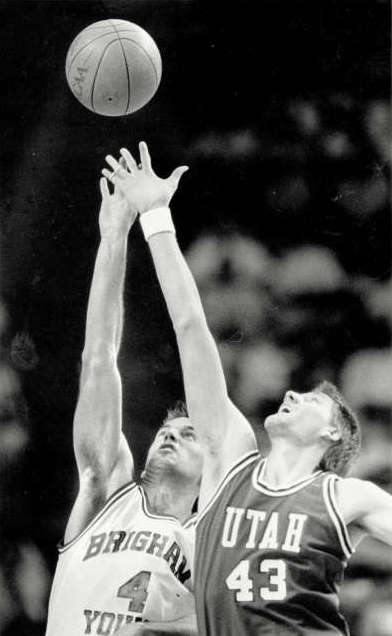 I mentioned that BYU All American Basketball sensation from the 80s, Mike Smith and I knew each other from way back and I told him that perhaps one day I’d write a story about our friendship. At the time I thought it would be a good read, but I needed to seek out Mike first and get his permission to write such a piece. So, with that urging, I found time to write him a few months ago and I fired an email off to Mike because I wanted permission to tell this story. I hoped that the email address was still good after 10+ years. And guess what? It was and he quickly answered back. He's still the same guy. No changes as far as I could tell. He cherishes that childhood we shared just as much as I. Mike told me to go ahead and write about our experiences. Then he reminisced about our days as kids, giving me even more ideas for material, even mentioning stuff I had forgotten about, such as: breaking down in my brother’s old triumph sports car on our way back from a Dodger game in El Monte near Legg Lake on the Pomona Freeway, briefly meeting Walter O’Malley at the Sunset entrance to Dodger Stadium, his strange Strat-O-Matic baseball strategies and our replacing “split cards” with a spinning wheel (a precursor to “Wheel of Fortune”) in the game. Which is something that only an experienced “Strat” player would understand. I put the idea of the post on the back burner. Waited for the appropriate moment. I told him it would be neat if we could meet up when the Clippers came to the Bay Area to play the Warriors...Oops, I kind of forgot about that mini commitment until last night. When we were young, baseball was such a big part of our lives. Summers were spent basking in the sun on playing fields. And we had competitive games. None of this little pansy stuff. We went all out. Good old country hardball. Mike was three years younger, but he played with my age group, and he was better than us by far. We developed a ball made out of contact paper tape that worked just perfect for our back yard. The size and weight was hardball size. If you made contact and hit a window, the tape ball would rarely penetrate through glass. (We only broke one window in all those years, and it was a real wallop too). If you got plunked by a fastball, you had a nice bruise and would be black and blue. We played tape ball in my back yard for years and we had absolute wars back there. 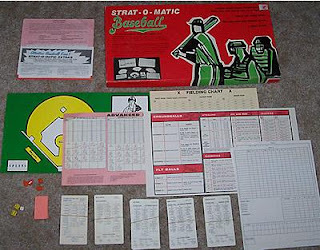 Beanball wars, base stealing, pick off plays, legit homers. It was a great fun, very competitive there’s no doubt. Since we’d fill the ball with rolls of paper and contact paper backing, there were times if you really hit it good, it would breaking into a bunch of pieces, making the intrigue of tape ball even more interesting. Dodger games were a part of that childhood and that meant frequenting the Left Field Pavilion where it was $1.75 for kids admittance. My older brother Taylor would take us as he had just received his driver’s license. We’d rush in when the gates opened and run up and down the rows picking up batting practice home run balls. We’d lean over the bullpen wall and talk to the likes of Jim Brewer and Charlie Hough, but Mike Marshall wouldn’t acknowledge our existence. We devoured Dodger Dogs, listened intently to Vin Scully and meticulously watched every pitch of every game. We visited with Francis Freidman out in left center field where she told us stories of Dodger lore from seasons past. Heck, she was famous to us. She was a regular on Bud Furillo’s Dodger Talk on KABC. Those were special times and 1974 was a season we’d never forget as the Dodgers won the pennant. I always sensed that Mike would make it to the highest level in sports. As he grew into adolescence, there was no doubt that he would rise to prominence. As a kid he had always made All- Star teams in every league he participated in. Basketball was the game he really excelled at, and with his enormous size and incredible shooting touch, he was recruited by all the big names: Bobby Knight, Coach K., Dean Smith. He could have written his ticket to almost any school in the nation, and they wanted him desperately. He was by far the most sought after prep athlete in Southern California in 1983. While Mike was quarterbacking Los Altos High School to the CIF championship, he broke a lot of CIF records with that pass happy ofense. He threw 8 TD passes in one game, setting what were then CIF records for passing yardage, attempts, touchdown passes, and completions, breaking Pat Haden’s marks. And football wasn’t even his best sport. Mike had this golden arm and I’m fairly certain, had he gone the baseball route, he would have been a Randy Johnson type of pitcher. They certainly couldn’t touch him in Little League. But he steered away from baseball and basketball was the natural route for him, with his height and dominance. He always could shoot. Heck he led the NCAA in free throw percentage his senior year. An amazing volleyball player, I have no doubt that he could have made the Olympic team in that sport with his size, strength and touch. I always felt that he Mike didn’t get a fair shake in the NBA. There are politics involved in all fields and Mike isn’t the type of guy that will make excuses, but I’ll say it. The press gave him some unjust labels in Boston when he was with the Celtics, and he got an unfair shake in the process. I don’t think he went into Boston fully understanding the rabid fan base and ruthless nature of the local media there. He decided that he needed to bulk up his slender frame with some additional weight and muscle before his first NBA campaign. That turned out to be a big mistake as Mike had difficulty adjusting to his new body size. Injuries resulted and he got off to a poor start. The press labeled him as lazy when the reality of the situation was he was just the opposite. He over did it in the weight room from too much preparation and it forced him to sit and heal at the beginning during training camp. Some reporters took his inactivity during the healing process and reported him to have a poor work ethic. By mid season though, his injuries began to subside and he got some playing time. They played him for a good stretch in his rookie year, he started in 7 consecutive games in February in March where he scored 16, 24, 21,12,16, and 11. It was a good run but coaching changes occurred and the stigma of the slow start stayed with him. Within three years he was cut and out of the NBA. So Mike took off to Europe, where he absolutely dominated the Spanish League. Years ago, I actually lucked out and pulled Mike's only basketball card out of the first pack I bought. As I opened the pack, the first card displayed was Michael Jordan, and the second card was Mike's. Another moment of fate? What were the odds of that happening? 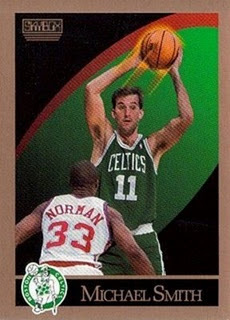 I’ll never forget watching him play for the Celtics, coming in to L.A., to take on Magic and the Lakers. Mike, who grew up a Laker fan, was now wearing the hated green shamrocks on his trunks. You talk about mixed feelings. I was rooting for the Lakers, but when Mike came in...I was rooting for him to do well. He didn’t see much playing time, just two minutes in fact, but at the end of the third quarter, he was inserted into the game. As seconds dwindled down at the end of the quarter, he lofted a jumper over the outstretched hand of Magic Johnson and the buzzer sounded, “swish.” Feb. 28, 1990. “Mike had really made it to the big time,” I thought. I was living my dream through him. During that basketball off-season, my brother Taylor set up a reunion for us all at the Left Field Pavilion. I was living in San Diego at the time, so after getting off work and packing up my young kids, we drove up to L.A. and arrived later than I wanted (which would be when the gates opened), but met up with my brother and his family and Mike too. He kind of stood out. Easy to spot the near 7 footer, sitting there in the outfield seats. We told stories, laughed a lot, remembered some of the heckling we used to do of opposing players like in the old days. (i.e. "Hey Luzinski, mix in a salad now and then!). Mike even told me that when he entered through the turnstile, the ticket taker said to him, “Wow, you’re a tall one, you outta play for the Lakers.” Little did she know she was talking to a Celtic. He told us stories of how life was in the the NBA. What it was like to have Larry Bird as a teammate. How he still was a Laker fan, even playing for the hated Celts. It was a fantastic day, and the last time I really got to sit down and chat with Mike, until I had 15 minutes with him today as he waited for his plane to be boarded. Having law enforcement privileges at the airport, I was able to accompany him all the way to his gate, just like we all used to do in the old days. It took a while for him to get through TSA, where they really put him through the ringer and confiscated his Old Spice. We sat down and chatted. We talked about friends, our family, our parents, our kids, work, life in general. There wasn’t enough time. I told him about the Dodger Blogger tournament and mentioned some of the participants on our team, many of whom he knew. He seemed to enjoy that. 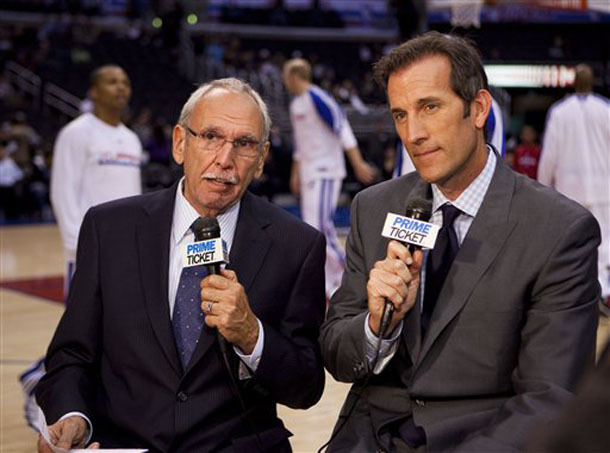 I mentioned that I get a kick out of seeing him on Fox Sports all the time and that his work is great...and I really mean it. He works hard, does his homework and you can tell that he puts time into his craft. We mentioned the hardships we had each endured in life. The unexpected turns that our years on earth take us. What it is like to grow old. His plane was boarding, and I knew he had to go. I pulled out my I-Phone and we posed for a picture. He said something funny right at that moment and I laughed, making my face a contorted mess as I snapped the photo (Oh, well). “I hope it’s sooner than that Evan,” he answered. We shook hands and I waved goodbye to my childhood friend, the kid I had spent so many hours pitching batting practice to. “I hope so too,” I thought, as I turned and went back to the terminal. I had to get back to work. Tony LaRussa changed the game in the late 80’s when while managing the Oakland A’s, he converted Dennis Eckersley into a 9th inning closer. 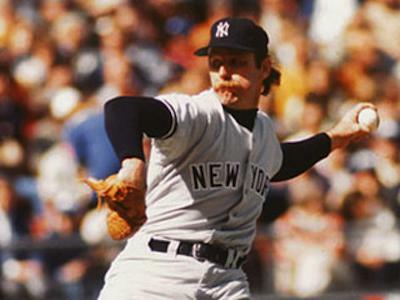 Prior to that time, closers would regularly take the ball as early as the 6th and 7th innings. 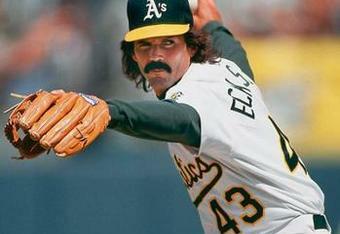 The extreme success that the A’s had with Eckersley changed the game. The mindset of managers developed into one that created the one-inning save. Look at the closers that were at the top of the game before then. Gossage, Sutter, Fingers, Marshall, Tekulve, Lyle, Quisenberry. They all would regularly go more than one inning and at times as many as three or four. The successful LaRussa experiment has resulted in creating a number of one-inning closers. Guys like Hoffman, Rivera, Percival, Wagner and Nen. Some of which are shoe-in hall of famers. In today’s game, all teams have a 9th inning guy (the closer), and 8th inning guy, a 7th inning guy and then the lefty specialists and the righty specialists and a mop up long reliever. If there was ever to be a change for the good of the game, I would think it would be a re-thinking of the way managers handle bullpens and clutch situations in the late innings. Let’s look at the Dodgers from 2002-2004. We all know that Eric Gagne was next to unhittable. He had what is known as the greatest run for a reliever in the history of the game. Unfortunately for us, Dodger manager Jim Tracy used Eric as all managers of this era do...by the book. Had he done things differently, he may have been able to steal a few more wins during that spectacular streak Gagne had. A little known record that Eric Gagne set was tying Tom Seaver for most consecutive strikeouts. Seaver did it in one game (against the Padres in 1970) but Gagne struck out 10 consecutive Rockies and Marlins over a 4 game span from May 17-21, 2003. Elias lists no official rcocrd for consecutive k's over multiple games. Gagne was used to strictly close out games. My argument against that is that it isn’t always wise to save your best relief pitcher for the 9th inning. There are times when he should be used earlier and failure to do so is the cause of a lot of late inning losses. Why use your 3rd or 4th best reliever in a clutch situation in the 6th or 7th inning that is a pivotal moment that often decides the game. Look at it this way. If your team is up 3-2 in the seventh inning and your opposition has runners in scoring position with less than two out, with the heart of a lineup coming to bat, why not insert your fireballing, lights out closer, to shut down the big inning? It makes perfect sense to me. Worry about the ninth inning when the ninth inning arrives. It is very possible that the ninth inning turns out to be an inning that is less challenging and more appropriate for another reliever. 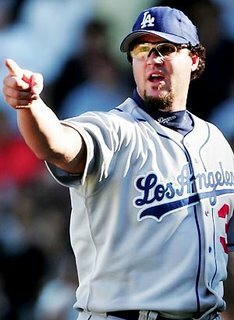 I’d much rather have Eric Gagne in his prime closing out a threat in the seventh than entering the ninth inning with a clean slate and no one on base. We saw it dozens of times with Gagne, the three out save that was a breeze, but a guy like Martin, Shuey or Carrara had to go out in an earlier clutch situation that was probably more better suited for a great reliever like Gagne. Of course, each situation needs to be appropriately evaluated. But in an eighth inning of a close game facing a Philadelphia trio of Utley, Howard and Pence, I’d much rather put my best reliever out there to face them than save him for the ninth when Polanco, Ibanez and Ruiz are coming to the plate. Every situation is different and there may be a need to go with a reliever that serves up ground balls in certain situations and maybe a strikeout artist closer isn’t always the answer, but more often than not, I want my closer out there in the tense “game on the line” situations. To that end, I believe that Dodgers are actually in a good position by naming Javy Guerra as their closer, who in my opinion is inferior in talent to Kenley Jansen. Don’t get me wrong, I believe Guerra is very good, but I’d rather have Jansen out there in crucial game deciding moments than Javy. With Jansen entering games at an earlier moment, often times with runners on base and the game on the line in the 7th or 8th, Mattingly is inserting his best reliever in clutch situations more often. Nine times out of ten, Guerra will enter the ninth inning of a save situation with nobody on base. 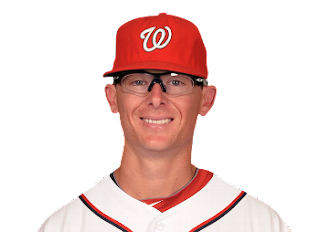 Tyler Clippard of Washington led the league in "holds" with 38. He sported a 1.83 ERA over 88 innings of work in 2011. For a manager to really make a difference and steal a few extra wins, outside of the box thinking is needed. I’d love to see someone like Mattingly develop this mindset. By naming Guerra the closer, he just may have adopted this way of thinking without even realizing it. Some say to not mix politics with sports. If you truly think about it, polar opposites on the political spectrum can unify in heart when it comes to rooting for the Dodgers. I can imagine Rob Reiner embracing Arnold Schwarzennegger following an emotional Dodger victory. In fact, it may have actually happened. In the course of my participation in Dodger related message boards and blogs, from time to time political discussion has raised its ugly head. I have found it surprising that someone that I get along and agree with 100% when it comes to Dodger baseball may have a political position or opinion that is 180 degrees apart from my own. Baseball does indeed unify the strangest of bedfellows. I figure that if I ever want to lose readership, all I need to do is start expressing political opinion over here. So on this President's Day, without pointing to political ideology , I'll keep things down the middle and we'll look at photographs of Presidential connections to the Dodgers over the years. 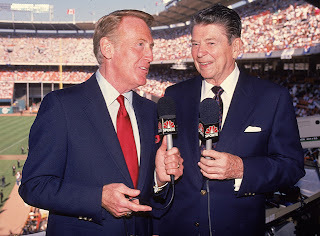 Vin Scully and Ronald Reagan at the 1989 All Star Game, Anaheim, CA. 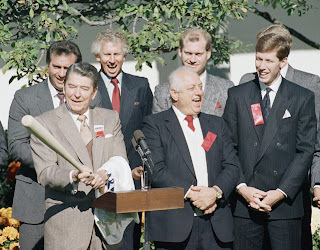 Photo with Ronald Reagan and the 88 Dodgers who presented him with a bat and jersey. Interesting to note that Don Sutton, who the Dodgers released at mid-season , was present at the Rose Garden meeting. Others identified are Mike Scioscia, Jay Howell, Tommy Lasorda and Orel Hershiser. 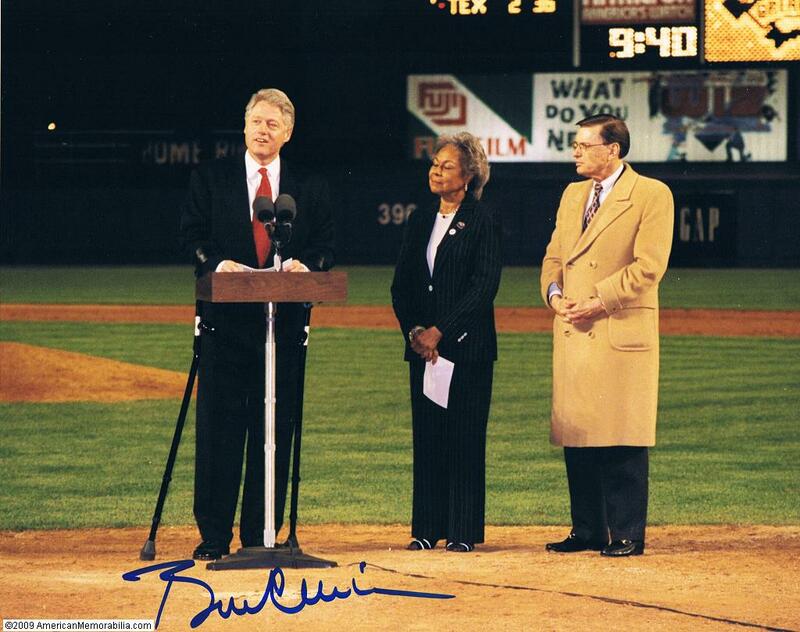 1997 Shea Stadium, Bill Clinton addresses the first ever jackie Robinson day crowd with Rachel Robinson and Bud Selig looking on. President Dwight D. Eisenhower throws out the ceremonial first pitch at the 1956 World Series at Ebbets Field. Looking on are managers Casey Stengel and Walter Alston. 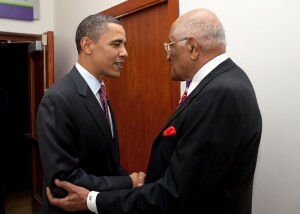 President Obama and Don Newcombe meet in Los Angeles in April, 2010. Obama is quoted as saying, "I would not be here if it were not for Jackie and it were not for Don Newcombe." 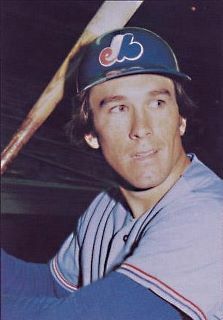 Gary Carter was a good man and the world is a lessor place today with his passing. A player with an infectious smile and a man that lived with tremendous faith. Everyone that came in contact with him has positive things to say. He was a man that knew the proper priorities in life and put his family first. He was a Hall of Famer in life as well as baseball. The "Kid" was a SoCal phenomenom, out of Fullerton's Sunny Hills High School, and many of us were aware of him before his arrival to the big leagues. 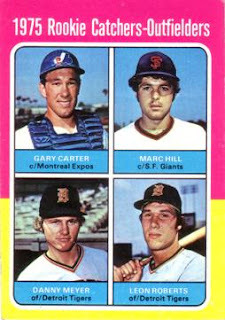 Starting the '75 season for Montreal in right field the day before his 21st birthday, Gary went 3 for 4 with a homer on opening day. By May 12th, veteran Expo Manager Gene Mauch decided that the enthusiastic "kid" was to replace journeyman catcher Barry Foote behind the dish. I remember attending his first Major League game in Southern California. Many were excited to see the young local boy start his first game at Dodger Stadium. It was June 9, 1975. I'm sure for Gary, it was to be a special night. It didn't turn out that way. As you can see by the box score. TB: L Biitner 2; R Coggins; T Foli. 3B: S Garvey (4, off W Fryman). HR: J Wynn (12, off W Fryman; 5th inn. 0 on, 1 out to LF). SH: S Yeager (2, off D DeMola). TB: J Wynn 5; S Garvey 3; R Auerbach 2; J Ferguson; R Cey; S Yeager. RBI: R Auerbach (10); R Cey (33); J Wynn (36); S Garvey (38). 2-out RBI: S Garvey; R Cey. With RISP: 1 for 6. Umpires: HP - Andy Olsen, 1B - Terry Tata, 2B - Ed Sudol, 3B - Bill Williams. With family and friends in attendance and excitement and butterflies in his belly, Gary struck out four times against veteran pitcher Andy Messersmith who threw a 4 hit shutout in less than two hours. I'll never forget the kid in his final at bat in the bottom of the ninth. With the Dodgers up 4-0, the Expos mounted their first threat of the night. Messersmith had walked the first batter and then gave up a single to Larry Biitner. After retiring the next two hitters, the young rookie eagerly stepped to the plate amongst a lot of fanfare. He wanted to redeem himself desperately and there was a lot of excitement in the air. Carter swung from the heals on two pitches as any eager Rookie would, coming up empty and then Messersmith pulled the string on a slow breaking ball that hit the corner, faking Gary out of his shoes as he took it for a called third strike to end the game. Home plate umpire Andy Olsen emphatically called him out and the crowd went wild as the Dodgers ran off the field victorious. Carter twisted and swung his bat in the air in frustration as he complained at the called third strike and stomped back to the dugout. Many in the crowd laughed as the young rookie ended his disastrous home town debut in dramatic fashion. The next night was more favorable to Gary as he went 1 for 3 in an Expo 5-4 victory over the Dodgers. I was hoping to have the opportunity to one day talk to Gary about that first night against the Dodgers that I witnessed. 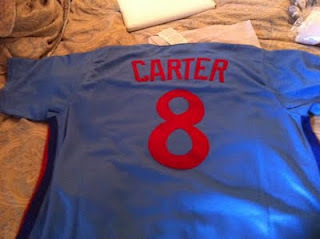 I even had purchased an Carter Expo jersey made by Mitchell and Ness and was ready to purchase a ticket for a signing last May at the San Francisco Cow Palace where he was to appear. Sadly, his illness surfaced and the cancellation was in order. I sent Gary a get well card, and hoped and prayed for him and his family. Fullerton mourns the loss of one of their great sons. Fellow Fullerton Hall of Famer Walter Johnson now has a batterymate to catch that slingshot blazing fastball of his. Rest in Peace Gary, you were one of the greatest.